Serving the Lehigh Valley with professional driver services for over 56 years! For over 50 years, Siegfried Chauffeur Services has been providing a reliable and dependable chauffeur service for the Lehigh Valley and Phillipsburg areas. We pride ourselves on offering qualified chauffeurs to drive your care just about anywhere, including long-distance travel. Owned and operated by Bill Krause, we guarantee our personal chauffeur services to be fast, prompt, and courteous. Safety and security, as well as comfort, has always been our number one obligation in getting you where you need to go. You can rest assured that our chauffeurs can be trusted with not only your vehicle, but also your life. 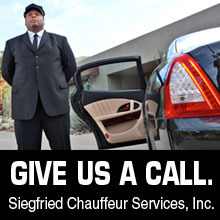 Call Siegfried Chauffeur Services for an excellent service that you can’t find anywhere else. Schedule your service with us today. We know you won’t be disappointed. Siegfried Chauffeur Services, Inc. is dedicated to safety and reliability in getting you to your engagements, while in the comfort of your own vehicle. Each of our drivers are certified, trained, & properly qualified to bring you to and from your appointments, trips, events and more. We ensure you will get to your desired locations on time and without any rush. You can rely on our experienced chauffeurs to provide the best possible service available. Please call us today for reliable and dependable Chauffeur Services for the Allentown, Bethlehem, Easton, Phillipsburg, Poconos, PA area and beyond. Our friendly and professional personal drivers will be glad to answer any question you may have about our services, and will get you to where you need to go. My grandmother does not get around very easily anymore. Siegfried shows up at her house and takes her to the doctor's when she needs to go. My grandmother feels more comfortable because she is in her own car! I hired Siegfried Chauffeur Services last weekend for my bachelorette party last weekend and they were great! My uncle has a large van so they came and picked us up and had us back home safe and sound. It was such a fun night. Based out of Allentown PA, Siegfried Chauffeur Services has drivers available to serve throughout the Lehigh Valley and surrounding areas. If you need professional driving services in the nearby Eastern Pennsylvania region, we'll be there for you. Call us today for our chauffeur services. I hired Siegfried Chauffeur Services last weekend for my bachelorette party last weekend and they were great!